Sweet Sophi was making a card for me yesterday. As she was contemplating what to draw, she asked Christi, "What does Daddy love?" "I know he loves basketball. But what does he love more than basketball?" Sophi responded, "I know he loves food. But what does he love more than that? "…ponder…ponder…ponder…"I know!!! Going to China and adopting a kid!" I couldn't help but smile when Christi told me. 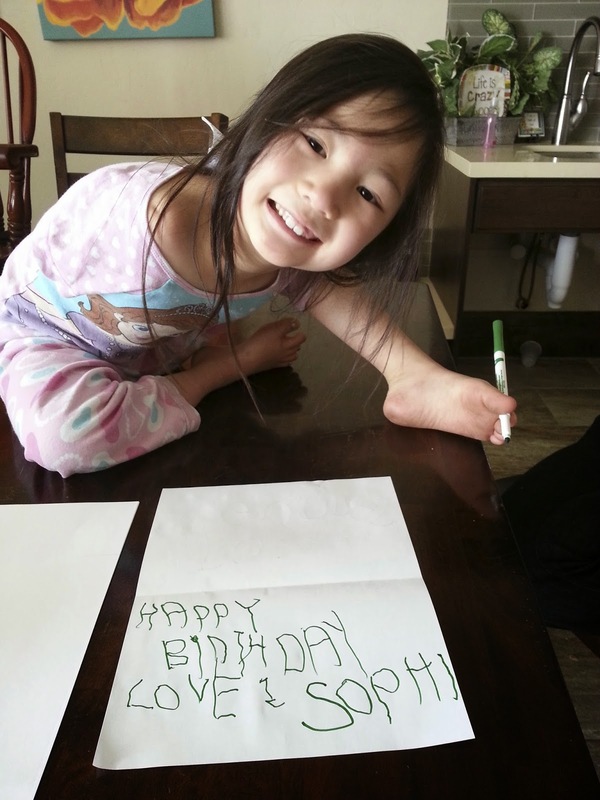 The picture below is of Sophi making a birthday card for a friend of hers. Christi told her what letters to write, but Sophi wrote them on her own. What a big girl! That is really cute and sweet! Going to China and adopting a kid! I love it.